Town Hall. 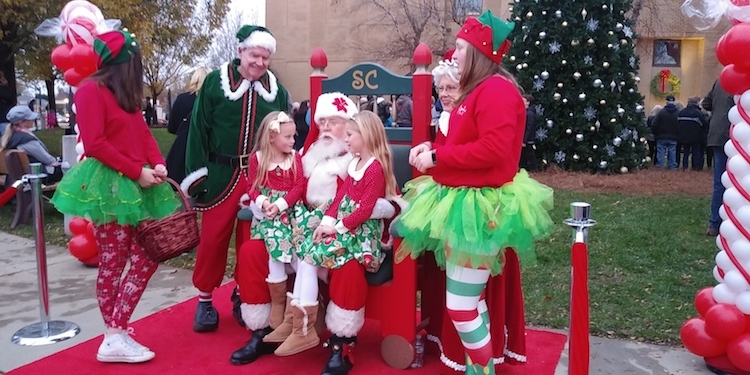 Hundreds of families were there for not just Santa, but food trucks, crafts and music. 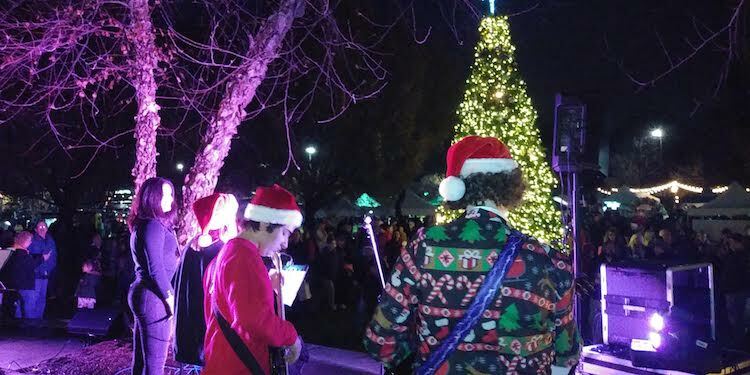 Put on by the PARC Dept., the event featured the annual tree-lighting on the lawn behind Town Hall. The official town tree has 10,000 lights. It’s 25 feet tall. There were waffles, beer and a bouncy house. PARC Chairman Scott Higgins assisted Santa; Mayor Pro Tem Michael Miltich was master of ceremonies. If it seems like Thanksgiving came early, it did. It’s the fourth Thursday of November every year, but this year November started off on a Thursday. We have one more Thursday this month, for a total of five. There are 29 days left till Christmas, according to Gene Ervin, a close personal friend of Santa, also known as St. Nick. His friendship with St. Nick started in the late 1980s while working at the Cornelius Fire Department’s annual Christmas tree lot. Ervin expects Santa back in town on Saturday Dec. 1, for the 36th Annual North Meck Christmas Parade which starts at 1 pm in downtown Davidson at the intersection of Griffith and Main Street, and makes its way down to Cornelius, ending around Antiquity. The Towns of Davidson and Cornelius work together on the parade which features high school bands, horses, tractors, school groups, old cars and civic organizations.